Never used a camper at a real campground we always boondock at MX tracks. Do I need to bring a cable for the cable TV?? Thanks in advance! And be sure to turn off your antenna power booster. Usually near the tv but could be anywhere even hidden in a cabinet. Regarding the antenna boost: I have a plate like you posted above. I also have another plate with a coaxial post next to it. I assume that one is for connecting the TV to a cable TV source connected to the outside of the trailer. But the Wineguard one has no cable going to the post on the faceplate. The cable is running from the TV into a hole in the wall NEXT to the Wineguard plate. Is there a connection behind the plate/in the wall somewhere taking advantage of the signal booster? I thought it was odd the cable to the TV is not attached to the post on the Wineguard plate. I have yet to turn on the TV, driveway camping this weekend to test systems. Thanks picker! So I'm guessing they connected the TV to the 'set 2' connection the rear of the plate. 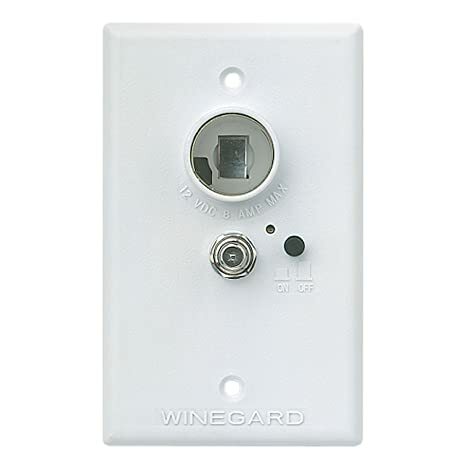 No clue as to why there is a 2nd wall plate with connection post on wall next to the Wineguard plate, if they connected the back of the Wineguard 'cable' connection to lead going to exterior cable hookup. I suspect you may be right about the wall plate to tv connection. I have a 2nd wall plate next to my booster wall plate. It has two coax connections. The first is a satellite home run (no splitters) to the outside. The 2nd allows the ability to connect a 2nd satellite receiver in the bedroom or send the satellite output signal from the living room receiver to the bedroom.